Dr T.P. Sarathy, a graduate of Metallurgy from the batch of 1990, speaks of his experiences in IIT Madras – in particular, his experiences with hockey. I feel extremely honored to share my experiences as an IITM Alumnus towards the blog. I was an active member of the IIT Madras hockey team during my B.Tech Metallurgy, Godavari Hostel, 1986-1990. In the final year, I was vice-captain of the team. My position on the field was forward (outside-left). It was a beautiful experience to play hockey for an evening with the current youngsters, a very high-enthu group containing quite a few skillful players, at the IITM grounds few weeks ago. More than 20 years since I had last played at that ground. It was also very nice to hear from them that IITM has been dominating the hockey scene amongst the IITs and I wish them the very best that they continue to do so. At the outset, I will apologize if the following all sounds so much about me and I. But again, maybe it doesn’t. It has been more than 2 decades and some memories still linger quiet strongly in the mind than others. I hope to describe some of them here. 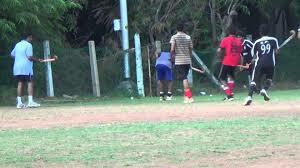 I played a lot of hockey during my school days @ KV, IIT Madras. I was also captain in my twelfth grade. My coach and mentor was a gentleman by the name of Suresh Babu, a very genial type of man, who presently still lives in Chennai and is involved with the sport. He in turn was a good childhood friend of, and used to play with, the legendary V. Bhaskaran, former captain of the Indian team that won gold in the 1980 Moscow Olympics. Perhaps that association with the sport helped me get in rather easily into the institute team in my very 1st year. However, I do recall the nervousness I felt when I went into the selection trials. There were about 20 of us competing to make it to the team. One by one, we were asked to dribble the ball with the hockey stick from the half line to the goal and back. When I completed my turn, I was delighted to hear shouts declaring “Captain, Captain” rent the air which I still recall as a very flattering moment. Of course, they were just joking. The captain, a senior by name Martin Ghosh was inspiring and motivated us to quite some wins in our inter-collegiate games. On a lighter note, and in case he is reading this article, let it be known that I can never quite forgive him for goofing up the penalty stroke which cost us the game against Anna University at their ground! The positive effects of having taken up the sport in my life are phenomenal. What you do on the field and how well you do that creates an impression in your mind about yourself and your abilities. This is inevitably carried off the field too, which is why I think it is important that when you play sport, to try and win. This can lend you immense strength, courage and tenacity in tackling hardships that come your way in regular life. As I maintain, hockey has never been a sport for the frail minded. Physically and mentally challenging, it entails special skills that other sports don’t. In my books this game is a treasure to behold. I think the best match I played in my years at IIT was against the IIT Bombay team back in 1987 in IIT Powai. They had this most beautiful grass field, so green and smooth that you could play pool/billiards on that ground. The best team was the host team itself who had this incredibly talented forward, a lean guy wearing glasses, call him X. Before the Madras-Bombay match, we saw him make a mockery of the defense of the other KGP, Kanpur and Delhi teams, and just score goals at will. So we developed a strategy, with the idea being ‘stop X’. As it turned out, I was assigned the man to “mark” him in our game against them. That’s exactly what I did. Instead of playing my regular forward position as an outside-left, I dropped to a defensive left half position with special task of marking X. I played with so much alertness and intercepted all the passes meant for him, X hardly ever received a ball that could have spelt trouble. I beat him move for move and rendered him ineffective, and even received lauds from the home crowd, as I recall. It was all absolutely fantastic and memorable. During my Placement interview in the final year, Mr Russy Mody, then Chairman and MD of Tata Steel, upon hearing that I was the vice-captain of the Institute hockey team, remarked to me that sportsmen tend to be tough in real life too and one of the colleagues he respected the most at Tata was a sportsman. Finally, I wish to share a line from the Yearbook in which my ClassMets (class of Metallurgy students) described me as “Hockey whiz – he is believed to be Mohd. Shahid in disguise. After all, no one has seen them together”. Mohd. Shahid as you may recall was a dashing forward for India with incredible ball skills and was a real treat to the eyes. While this is obviously a huge exaggeration, I have felt constant gratitude, strength and encouragement from these words of my classmates, words that I have carried with me for god knows how many years to lend me strength, confidence and good spirit. Personally, the game gave my 4 year stint a sense of completeness, a sentiment I am sure many of the present students will agree with. Today, I am happy to say that I actively play once a week with a few other IITM Alumni which is a rewarding experience. Of course our limbs move so much slower but we are so happy to just stay connected to the game, and through that with each other. Wishing the readers all the very best.